Marinara recipes need not feature seafood. They are basic tomato-based pasta sauce recipes. 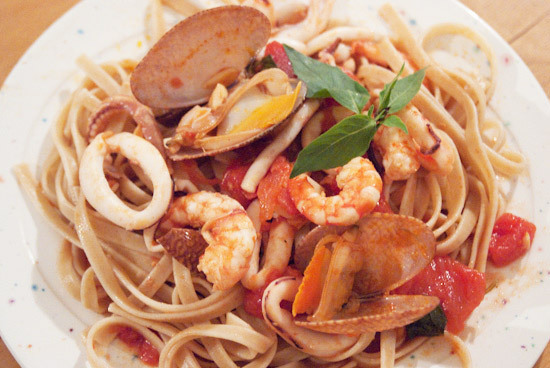 Like most people, I used to think that marinara recipes always include a mixture of seafood, usually prawns, squid, white fish and mussels, in a tomato-based sauce. In fact, I also used to think that "marinara" means seafood pasta - because the only pasta marinara dishes I ever saw on restaurent menus were those with the seafood mix. I was wrong. But excuse me, I am not Italian. Imagine my surprise the first time I came across (on the Internet) marinara recipes such as chicken marinara and beef marinara! That was when I discovered that Marinara has less to do with marine life than with mariners, that is, sailors. Marina means "in salior style" and it actually refers to the tomato-based pasta sauce that was traditionally cooked for sailors returning from their sea voyages. This sauce may be served with with various ingredients. So yes, it is perfectly fine to have marinara recipes prepared with beef, chicken, etc. Or only shrimps, only mussels... Those recipes that feature a mix of seafood should rightly be called seafood marinara recipes and not just "marinara". More interestingly, I learned that marinara refers to a specific type of tomato-based pasta sauce that originated from Naples. Some Italians actually feel upset that marinara recipes have been "bastardised" to include ingredients that did not belong in the original version, such as onions, celery, parsley, oregano, etc. As with all traditional recipes, there will always be arguments about which is the correct version. Besides arguing over ingredients, one of the marinara recipes that I came across even insisted that the basil leaves should be left whole and also taken out from the sauce before the sauce is served. Again, me not being Italian, I am in no position to join in such debates. However, I am all in favour of simplicity - because I feel that simple dishes, with just a few ingredients, have longer-lasting appeal. They also put the cook to the test. To prepare simple dishes well, techniques become crucial. So does the choice of quality ingredients. My recipe for a marinara sauce is therefore a very simple, basic one. For convenience, I used canned tomatoes although some purists insist that a true marinara sauce should be prepared with fresh tomatoes. Place a heavy pan over high heat until it is somewhat hot. Add olive oil and allow for it to heat up. Add garlic and fry until fragrant, but before it turns golden. Add canned tomatoes, salt and basil. Reduce heat to low and simmer for half an hour. Sugar: Although sugar would not have been used in traditional marinara recipes, a bit may be added to counter the citric acid present in most canned tomatoes. Ideally look for canned tomatoes that do not contain citric acid. Otherwise, add just a bit of sugar - one tablespoonful or less for the above recipe. Black pepper / chilli: Most Italians would not quarrel with some black pepper as seasoning. At the same time, I have also come across supposedly authentic marina recipes that include a dash of chilli powder, or a small amount of fresh red chilli, cooked together with the tomatoes. Red wine: Again I have seen red wine used in supposedly authentic marinara sauces. If you like wine in your cooking, add about 1/2 cup to the above recipe. 300 grams spaghetti, linguine or other dried pasta, cooked according to packet nstructions. To prepare the squid, remove guts and the transparent "spine", wash and cut into thin rings. Some people would also remove the skin but I don't consider this necessary. Shell and de-vein the shrimps. TIP: Toast the head and shells (in a toaster oven) and keep for a seafood soup stock at another time. Scrub the mussels and remove the "beard". Discard any that are already open (and would not close when touched). Normally I use ready-cooked, frozen green mussels from cold waters (such as New Zealand) because in Singapore where I am, the fresh mussels tend to be small and have a "muddy" flavour. Heat oil in a heavy pan, add garlic and fry until they are fragrant but not yet brown, about 1 or 2 minutes. Add seafood and cook over medium heat for about 5 minutes - until squids turn opaque white and shrimps turn light red. If using fresh mussels, they should open when cooked. Discard any that fail to open. Pour in the marinara sauce and cook another two minutes or so, until eveything is heated up. Click here for an index of tomato-based, not necessarily marinara recipes.